It is still a common perception: skin creams are for women; �real men� don�t touch the stuff. The truth is, men have groomed their skin with lotions and potions for millennia. Natural black skin care products for men have a long history. From as early as 7000BC, Egyptians used the fatty oils from olives and sesame to make skin grooming products for men. 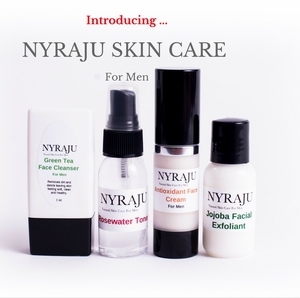 We�re continuing this grooming practice by offering a Natural Black Skin Care Sample Kit for our Men. More often than not, men�s products cover beard and shaving needs and your skin in general is ignored. We�ve taken care of this for you. A simple three step process for daily use and an exfoliant for dead skin cell removal twice a week. A Green Tea Cleanser, Rosewater Toner ( that serves as a great after shave treatment) and the Antioxidant Face Cream to moisturize your skin. The Jojoba Exfoliating Scrub is not for beard use. Those little wax beads will take forever to remove them from your facial hair. 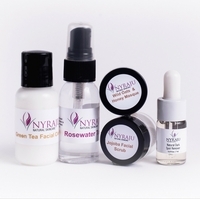 Rosewater Toner � Wet a cotton ball or square, squeeze out the excess water and add a spritz or two of rosewater toner to it. Rub gently across your face and neck. Works great as an after shave product. Do not use in beards, the jojoba wax beads will be challenging to remove from facial hair.